Call of Duty: Black Ops 4 has dropped its latest update, and it’s a fairly meaty one, particularly if you’re playing the game on PC or Xbox One. Those platforms now get the Operation Absolute Zero and Multiplayer Map Pack 1 content that PS4 owners have been playing for the past week. Operation Absolute Zero is a free update, which includes the new multiplayer Specialist, Zero, an expansion to the Blackout map, and more (get all the details here). The Multiplayer Map Pack is part of the paid Black Ops Pass, and includes two new multiplayer maps and a Zombies expansion (get the details here). We’ve implemented our first balancing pass on Zero, our new Specialist. As with all new features in Black Ops 4, we’ve been paying close attention to how Zero plays into the overall Multiplayer experience and have tuned some of her abilities accordingly. 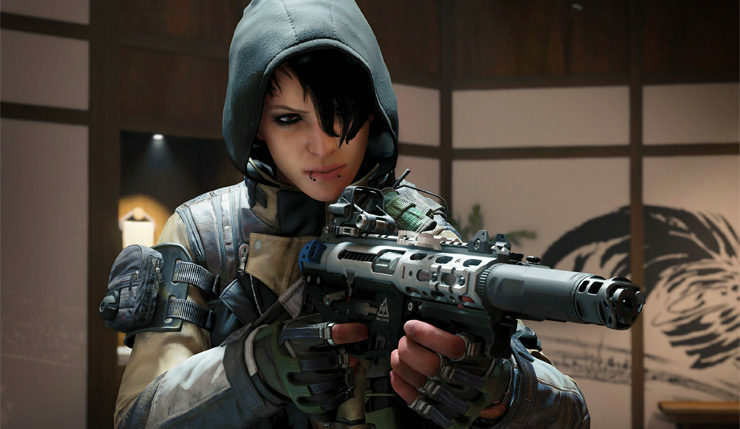 This includes an increase in the time it takes to earn her Ice Pick, varying increases to the time it takes her to hack Scorestreaks and Torque’s Barricade, preventing her hacks from freezing enemy healing cooldowns, and more. Take a look at the full patch notes below for the full list and let us know what you think. In Blackout Custom Games, players can start a private match to explore the map at their own pace and practice Blackout with teams of friends. Custom Games in Blackout will initially support a max player count of 12 – this is planned to grow over time as we evaluate player engagement, and we’re already planning expanded feature support over time. Blackout Custom Games will support private matches in Solos, Duos, and Quads, as well as full character customization and Weapon Camo support. Today’s new audio improvements in Blackout are focused on vehicles. We’ve lowered the volume of the Supply Drop plane to ensure players can hear more of the in-game action while the plane is overhead, and vehicle engines can now be heard more reliably when several other sounds are playing. The ARAV can also now be heard from farther away to help prevent surprise ambushes. Yes, we’ve seen the footage. Starting today we’ve unlocked all Specialist characters in Blackout without requiring players to track down and complete their Character Missions, to ensure all players can play as the Specialist of their choice. For those players who’ve already put in the time to unlock their Specialists the old-fashioned way, we’ve got a special new Blackout-exclusive outfit reward for you called “The Numbers.” Players can also earn this outfit for each character by finding and completing these missions, which are now called Outfit Unlocks. These are new types of Supply Stashes that you’ll find throughout the world, which can contain the new Secret Santa and Slay Bell melee weapons from the Black Market. Ho ho hooooly sh*t, they’re deadly! In Zombies, we’ve implemented a new round of gameplay improvements across all maps and a handful of stability fixes to help smooth out some of the remaining bumpiness players might have experienced. While we believe the vast majority of lingering Zombies stability issues have been eliminated with this update, we’re always investigating further ways to deliver an even smoother experience in future patches. Finally, we’re happy to introduce an accessibility feature that we’ve been planning for a while: the new Auto Sprint option will allow players to double-click their controller’s left stick to automatically sprint in Multiplayer, Blackout, and Zombies. Players can enable this setting under Controls in the Options menu. You can check out the full Call of Duty: Black Ops 4 update 1.10 notes right here. Contraband stashes and the changes to Blackout unlocks are exclusive to PS4 for the next week – the rest of the changes and additions are available on all platforms. Call of Duty: Black Ops 4 is available on PC, Xbox One, and PS4.